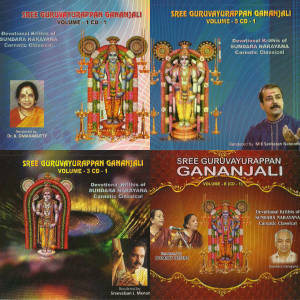 Sundaranarayana Gananjali Trust works to popularise the work of Sri Sundara Narayana. Sundara Narayana was a devotee of Guruvayoorappan and he considered his music as one of Guruvayoorappan's miracles. A resident of USA for the major portion of his life, Sundara Narayana began writing songs in praise of Guruvayoorappan late in his life. Inspired by devotion towards Guruvayoorappan, he sat down to write his first song starting with "Hari Om Narayana". To his own wonderment, words came to his mind as if "a tap was open". During the following years, more than 200 songs were written. In this CD (first in set of two CDs), Bombay Sisters have rendered 5 Kritis of Sundara Narayana. In this CD (second in set of two CDs), Bombay Sisters have rendered 5 Kritis of Sundara Narayana.